The fan motor for the DustPROOF range of virtually silent fans is extremely quiet. The AcoustiFan™ DustPROOF series use the highest quality double-ball bearings available for reliability, use-anywhere inside a PC for extra long life expectancy (upgrade your PC and take these fans with you!). One of the unique features of these PC fans is that the motor has been completely sealed from the outside environment. This prevents dust entering the motor and also reduces the amount of noise perceived to be coming from the bearings within the motor. 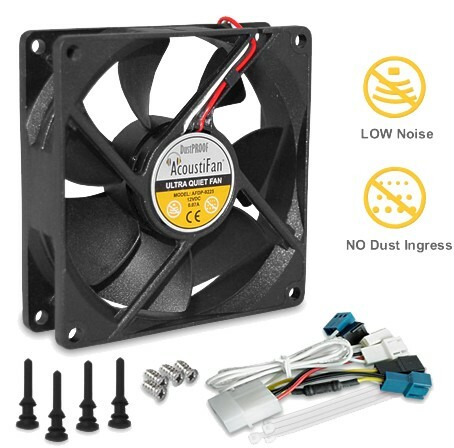 Each DustPROOF™ quiet fan is also supplied with a unique 3-speed fan cable which offers maximum flexibility (3-pin or 4-pin Molex power connectors), along with the ability to select a fan speed suitable for your PC and noise sensitivity. The black connector will run your fan at full speed (12V), the blue connector will run the fan at medium speed (7.5V), and the white connector will run it at minimum speed (5V). However, if you opt for the white connector (minimum fan speed), be certain to design the airflow through your PC system carefully and monitor system and component temperatures. Acousti have even included four handy cable ties with each DustPROOF™ fan! The DustPROOF™ quiet fans also incorporate an Auto Start safety feature. This feature is built into the fan's PCB and automatically restarts the fan after the release of any obstacle which has prevented the blades from spinning. Fitted 2 of these today and the reduction in noise was immediate, even with the case covers off !! Really loved the rubber fan mounts, brilliant idea :) Everything in the box too, fan, cables & choice of mounts, great value for money !! Another first class product from the "top" noise reduction site. Quality component (hence the price). Even at full tilt all you can hear is the "hush" of flowing air - but only in a very quiet room. Rubber mounts work - no vibes transmitted to the case.